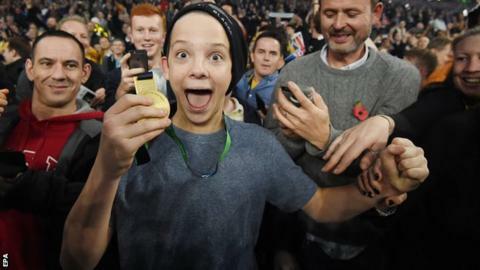 One young rugby fan left Twickenham with the ultimate souvenir after Sonny Bill Williams handed him his winner's medal. But the youngster was lucky to make it to his hero after being "smoked" by a security guard, as he was tackled to the turf. But double World Cup winner Williams picked the 15-year-old up off the floor, and allowed him to join in the celebrations with the players before draping the medal over his neck. "He got smoked by the security guard, like full-on tackled," said rugby league convert Williams, a former New Zealand national heavyweight boxing champion. "It was pretty sad. He's just a young fella obviously caught up in the moment. "If that was a younger brother or cousin, I would have given the security guard a hiding. But I just picked the kid up and took him back to his old lady and tried to make the night more memorable for him." Lines' parents later wanted to return the medal, feeling "it was the right thing to do", but Williams has insisted he can keep it. He was then presented with a replacement by All Blacks captain Richie McCaw at the World Rugby Awards in London on Sunday. Williams came on as a second-half replacement and his offload set up Ma'a Nonu to score the second of three New Zealand tries. The 30-year-old was lauded for his sportsmanship when he consoled opponent Jesse Kriel in the wake of the All Blacks' semi-final win over South Africa. Explaining his decision to give away his medal, he added: "I know he'll appreciate it and when he gets older he'll be telling his kids - that's more special than it just hanging on a wall. "Better for it to be hanging around his neck than mine. I'm sure he'll remember it for a while. His mum was pretty happy. He had an All Blacks jersey on so he might be a future All Black." All Blacks world record points scorer Dan Carter, who is retiring after Saturday's final, described Williams' gesture as "priceless" and added: "It just goes to show the kind of guy he is. He's very giving. I'm not so sure if in the same situation I'd do it."